A man and a woman are engaged in conversation over three panels. Woman: Explain to me again why you won't let me flush the toilet? Woman: And why our A/C is off in this heat? Woman: And why you won't let me use my cellphone? Woman: And why we unplugged our Internet? Woman: And what is that crap on our lawn? The fourth panel shows the exterior of a house. Nearby, an odd-looking irregular object is seen, which bears irregular shapes that resemble a human face. Voice 1 from house: It's my art. It's only for a week. Voice 2 from house: But why? Voice 1 from house: I told you. The fifth and final panel shows the man and the woman again. 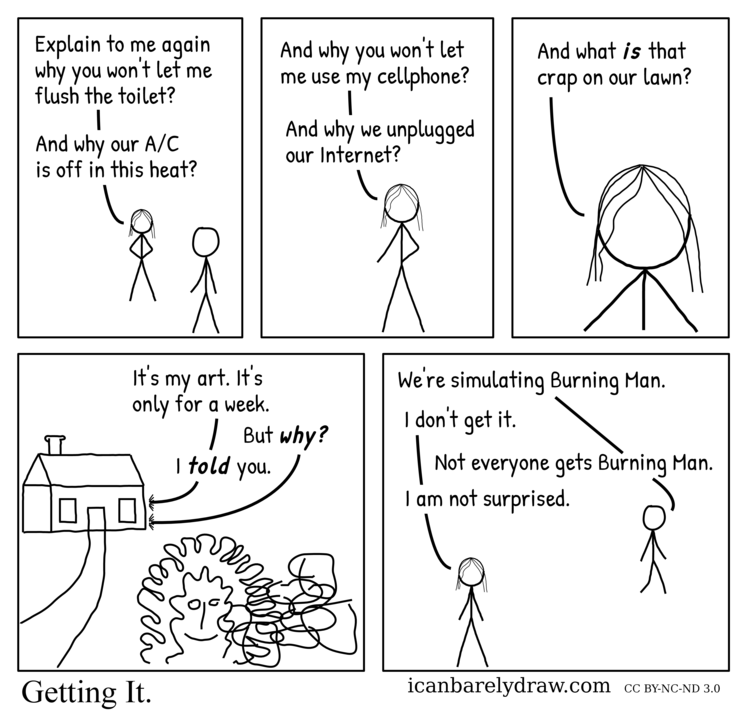 Man: We're simulating Burning Man. Man: Not everyone gets Burning Man. Woman: I am not surprised.